Harry Reid and John Boehner are taking advantage of the congressional holiday recess to put in some public service time to help Santa manage his vast workshop and get all of the toys ready for shipment by Christmas Eve. 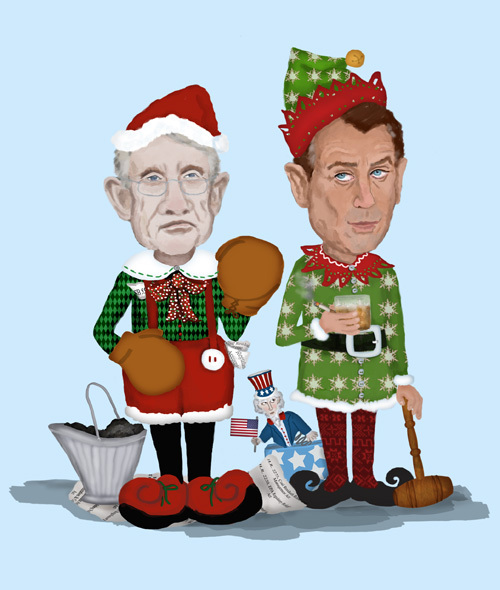 Sen. Reid’s is still at his high school boxing weight and has put on his old gloves so as to be ready to deal with any Grinches that might attempt to interfere with Santa’s Yuletide activities. At Santa’s direction, he has readied buckets full of coal lumps to be loaded onto the sleigh for use at the homes of the ever-increasing population of unrepentant naughty children. The proliferation of naughty children around the globe has been a boon to the coal industry which has been experiencing a prolonged slump as a consequence of stricter environmental regulations. In instances where a lump of coal in a stocking is insufficient to convey the message regarding the undesirability of naughtiness, Santa has recalled his old friend Krampus from vacation to mete out strict punishment to the naughtiest of children. A well-tanned Rep. Boehner is sipping a scotch and enjoying a quick smoke to steady his nerves as he prepares to dive into Santa’s complex just-in-time inventory supply chain management system. Earlier, he prepared a report for Santa regarding Sen. Reid’s proposed “nuclear option” to replace the reindeer with a highly modified marine reactor as the source of propulsion for the sleigh. This would reduce the number of refueling stops for reindeer fodder and significantly increase the range of Santa’s sleigh. However, Santa ultimately discarded this recommendation because reactor waste has a half-life of 160,000 years, as opposed to reindeer waste which has a half-life of less than ten days and is easily recyclable for use in Mrs. Claus’ flower garden. The elves have assured Santa that they have complied with the all of the current FAA Airworthiness Directives affecting his model of sleigh and have performed proper weight and balance calculations to take into account his imposing load of presents, coal and reindeer food. Santa himself is busy planning this year’s route by reviewing the global weather forecasts and the latest Notices to Airmen published by the FAA. Santa has resolved to check all of his lists twice this time in the wake of that embarrassing incident two years ago when the Wyoming Department of Game and Fish refused Santa’s reindeer permission to entertain the children at Murdoch’s Ranch and Home Supply, which led to the frustrated reindeer becoming intoxicated at Mingle’s Lounge next door and running up a big tab on Santa’s American Express Card,. Santa also decided to move his Naughty and Nice list into a secure cloud computing environment after his IT elves discovered that the NSA had covertly accessed his data and was surreptitiously changing some high-profile individuals from naughty to nice and vice-versa. After a long cold holiday season of scaring naughty children into exhibiting better behavior, Krampus takes a well-deserved vacation at a warm tropical location. 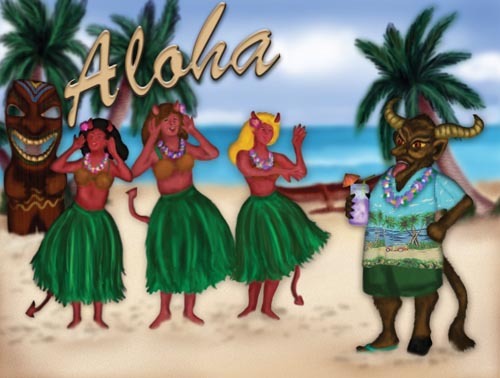 On the beach on Maui, Krampus sips a cold refreshing beverage while enjoying a presentation by a local hula troupe. In the United States, Santa is taken for granted. It is a foregone conclusion that Santa will always deliver on the presents. Kids in America don’t know how good they have it because no matter how naughty they have been during the year, Santa will never fail to bring them something. In fact, the very worst they can expect is that Santa will fill their Christmas stockings with lumps of coal. This is not the end of the world, because with the soaring cost of energy reaching unprecedented heights, the children can easily pool their lumps of coal and sell them to the local power utility and use the cash to buy the gifts that Santa did not bring due to their naughtiness. However, in Europe, children have a lot more to fear, particularly in Austria, Switzerland, Croatia and Germany. In those countries, jolly old St. Nick hands out gifts on his feast day of December 6th. However, he does not punish children himself no matter how bad they have been. 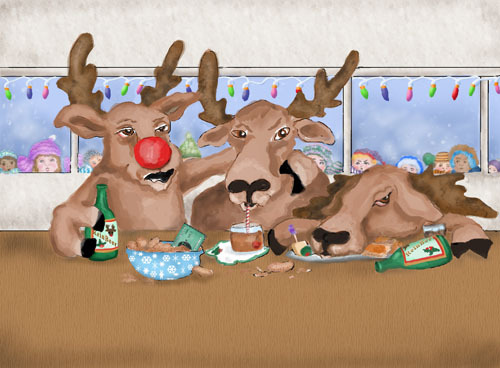 Instead, he delegates that task to a terrifying horned creature called the Krampus, who accompanies Santa on his visits and metes out punishment according to Santa’s instructions. The children that Santa has fingered as naughty are seized by the Krampus, who whips them with a switch of birch branches or with rusty chains. In extreme cases involving exceptionally naughty children, the Krampus is said to carry them in his backpack to the forest where he proceeds to devour them. Alternatively, the Krampus simply stuffs them into a sack which he then tosses into a stream. People who have observed the widespread lack of discipline, manners and work ethic that characterizes today’s youth have suggested that a serious dose of Krampus might be in order here in America. The origin of the Krampus can be traced back thousands of years. It is believed that the Krampus was an evolution of the Norse god Loki that was slowly assimilated into Christian tradition. Many European countries today organize Krampus festivals on December 5th, the day before St. Nick arrives. A number of designated individuals dress up as the Krampus and go from house to house scaring children with their growls and their switches and drinking schnapps with their parents. As the night progresses, it is not unusual to see the Krampus throwing up in the gutter. If a Krampus should approach you in the darkness of night, you will certainly know him by his long horns and his most unusual characteristic of having one humanlike foot and another that resembles a cloven hoof of a goat.